Fluted polypropylene is economical, durable and printable. Corrugated polypropylene sheets are durable for use both inside and outside, and corrugated polypropylene sheet is low in cost, easy to fabricate, and provides good impact resistance. At Diffuser Specialist, our Flat sheet light diffusers include many styles of Corrugated Polypropylene that are manufactured in the U.S.A., and we also can create custom orders to fit your needs. 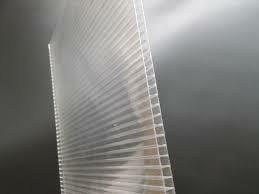 You can find all of our Corrugated Polypropylene sheets and flat sheet diffusers here. You can also view a Fluted, Corrugated Polypropylene Spec Sheet, Here. Here are some examples of how people and businesses are using it: Menu Boards, Indoor Signs, Temporary Signage, Yard Signs, Trade Shows, Special Events and Directional Signs. Given its lightweight quality, corrugated plastic also offers very convenient mounting options. For instance, you can display a corrugated polypropylene sign via velcro, double-sided tape, suction cups, sign stands or even easels.